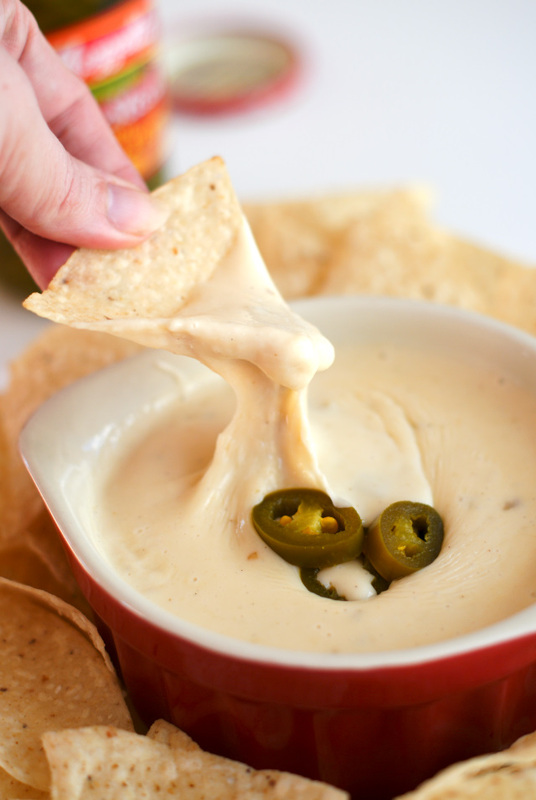 This Crock Pot Queso Blanco Dip is my version of the popular Mexican white cheese dip that is served at your favorite Mexican restaurant! You won't believe how easy this dip is to make at home in your crock pot! I have this thing for white American cheese. It's the stuff I grew up on and it's still my favorite today. Not the individually wrapped slices, but the kind they cut for you at the deli. Loooooove it. I melt it into scrambled eggs, use it to make the best ever grilled cheese, and I use it for my very favorite Philly cheesesteak sandwiches. It's always stocked in my fridge and one hundred percent our family favorite. That's why I love this dip so very, very much. It is made with my beloved white American melted with lots of other goodies like green chilies, cumin, and onion powder. 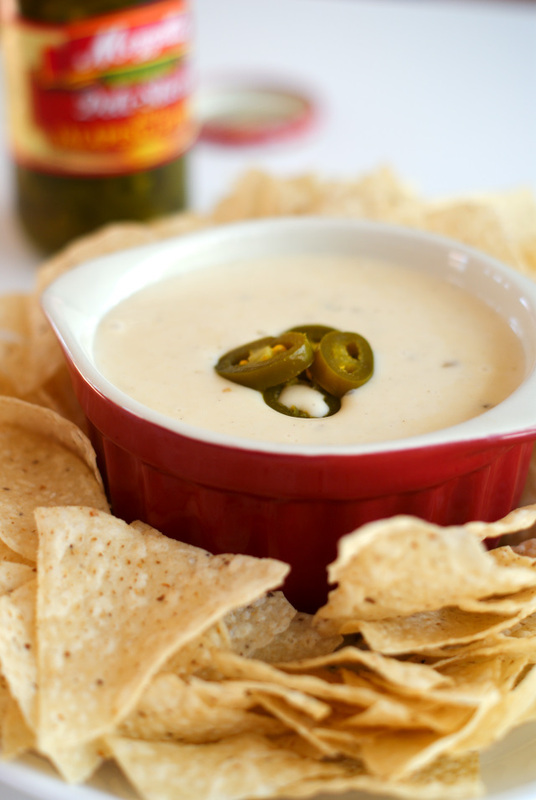 Together they make an irresistible, melty, cheesy queso blanco. You know queso blanco, right? 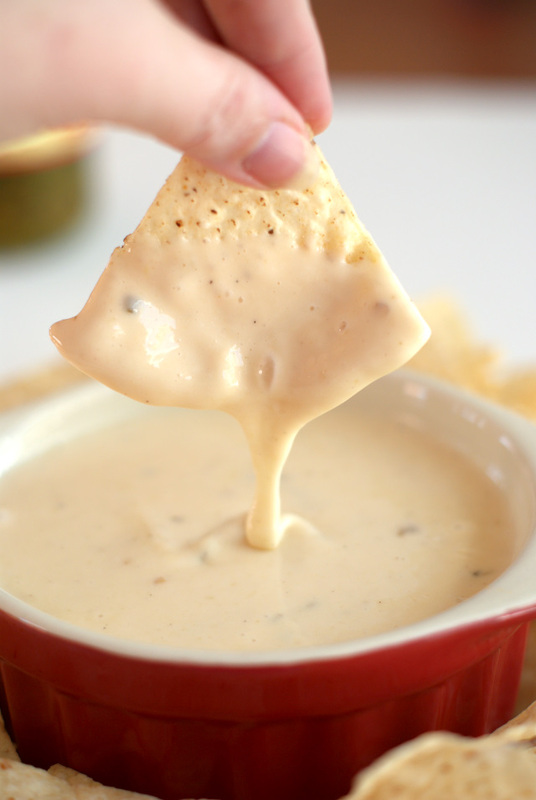 It's that amazing Mexican white cheese dip they serve with tortilla chips at your favorite Mexican restaurant. So darn good, right? I could eat it forever. This is my take on the restaurant fave. There are lots of variations of this tasty cheese dip, and my local Mexican place might serve something a little different than yours does. You can add, remove, or adjust the add-ins, but the one thing you can't substitute is the white American. It's the key to this recipe! This recipe makes a good size crock of dip, so go ahead and make it for a crowd. It would be the perfect addition to a taco bar, drizzled on chili, or served with tortilla chips alongside all of your other fave finger foods for the big game! Make it and watch it disappear! 1. Place the cheese in your crock pot and top with the green chilies, onion powder, and cumin. Pour the evaporated milk over everything. Cover and cook on low for one hour, stirring every 15 minutes. Serve immediately or keep warm in your crock pot until ready to serve. Get your white American cheese at the supermarket deli counter. As them to make you two thick slices, which should end up being right around a pound. Shred them at home with your cheese grater! I recommend Land O' Lakes or Boar's Head brand. Ths is a fairly mild dip. If you like a spicier dip, try adding some chopped pickled jalapenos or a pinch of cayenne pepper. Garnish with fresh chopped cilantro of pickled jalapeno slices, if desired. Try dunking raw veggies, pretzels, or the usual tortilla chips! This will thicken up rather quickly. Keep warm in a crock pot or, if transferring to a bowl, plan on serving immediately. Sounds wonderful...will be making it this week!! Thanks! I hope you loved it as much as we do! I made this and loved it! But today i tried again and didnt jave evaporated milk so i used regular milk. It has an odd almost grainy consistency-could the milk cause that? Or would it maybe one of the cheeses??? Hi! I'm so glad you made it and liked it! Such a bummer it didn't come together the second time. I have never subbed the evaporated milk for regular milk, but I have read somewhere (I don't remember where!) that evaporated milk helps to melt the cheese more smoothly. I also think that different brands of cheese do melt differently. Did you use the same brands as last time? Pre-shredded or shredded by you? Graininess can also happen from the sauce getting too hot. Could that have possibly been a factor?